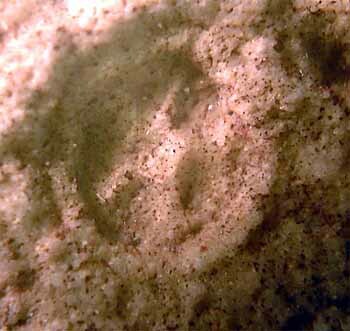 Among the many enigmatic fossils of the Precambrian is an impression named Arkarua adami. The name "Arkarua" comes from a mythical giant snake of the Aboriginal peoples who live where the fossil was discovered  the Flinders Ranges of south Australia, near Adelaide. Arkarua occurs alongside Dickinsonia, Tribrachidium, Cyclomedusa, and other familiar Ediacaran animals as well as many new and as yet undescribed species. The image of Arkarua shown above was taken from the holotype specimen. Arkarua is a small disc-like fossil, and was described as an echinoderm. If this is correct, then Arkarua is the oldest known echinoderm. The fossils preserve what appears to be a five-lobed central region that is interpreted as five ambulacral grooves, which are characteristic of echinoderms. Unfortunately, the fossils found in sandstone thus far do not preserve any details of the internal organs. No evidence of a stereom or water vascular system is known for Arkarua, and these are considered the diagnostic features for echinoderms, so the identification is still inconclusive. 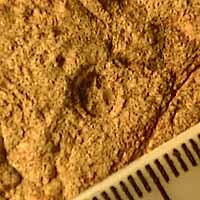 Fossils of Arkarua: Impressions of Arkarua are usually 3 to 10 mm across, so they are not easily seen with the naked eye. On the left, you can see a rock in which several impressions have been preserved. The organism itself would have filled the space of the impression, so you are actually seeing a "negative" image. Images of Arkarua taken by Lisa-ann Gershwin from type collections housed in the South Australian Museum. Gehling, J.G. 1987. 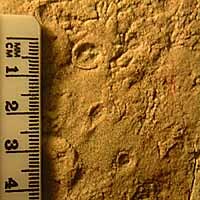 Earliest known echinoderm  a new Ediacaran fossil from the Pound Subgroup of South Australia. Alcheringa 11:337-345.